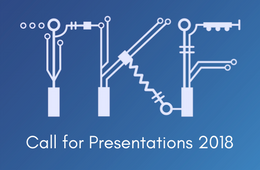 We are pleased to announce the TechKnowFile 2018 Call for Presentations. TechKnowFile (TKF) provides a forum for U of T’s Information Technology professionals, Administrative and Academic staff, to share, discuss, and disseminate their innovations, viewpoints, and technical achievements. At TKF, views on current IT trends, thought leadership, and new technologies are presented by community members. We are also pleased to welcome TKF sponsors as they share their latest technologies and viewpoints on different aspects of IT. PRESENT: Conference presenters will be able to host a 50 minute session to showcase their work to the conference delegates. Proposals are welcomed across all IT topics relevant to higher education technology, communication tools, management and leadership. Find out more. TEACH: Do you have a great skill and always wanted to teach a course? TechKnowFile is offering an opportunity to interested community members to teach a 50 minute hands on tutorial during the conference. Find out more. DISCUSS: We are looking for individuals who are interested in participating in vibrant and dynamic discussion panels on key IT issues. The panels will be 50-90 minutes long, depending on the topic. Find out more. Not sure about what you might want to present? Questions? Comments? Ideas? Please email liam.karry@utoronto.ca.